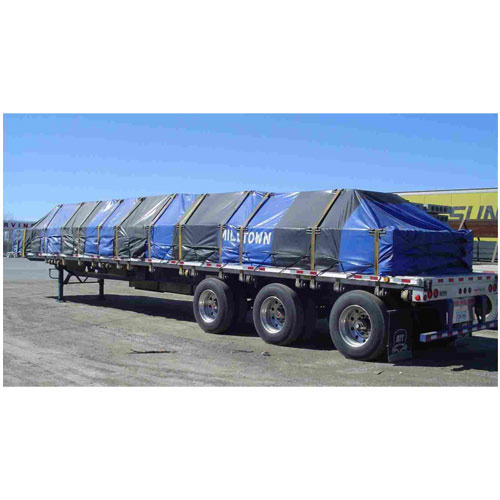 We are a leading manufacturer, exporter and supplier of impeccable quality of Truck Tarpaulin that is used to cover the material loaded in the truck. The offered tarpaulin is manufactured using high grade basic material and the latest technology by our adroit professionals. Our provided tarpaulin is tested by our quality controllers against various parameters. Apart from this, offered tarpaulin is available in various sizes, colors and thickness. Shree Adinath Woven Sacks Private Limited, one of the leading manufacturers, suppliers and exporters of this highly commendable range of Woven Sacks And Fabrics, began its operations in the year 2007. The range offered by us, comprises the finest Fabrics weave, PP Bag and Fabric Roll, which are highly desired and demanded in the market. Making of this range is done as per the set norms and guidelines of the industry and utilizing the finest materials. This ensures the product’s finishing and tearing strength. Further, the range is quite reasonably priced. The highly advanced state-of-the-art infrastructural facility at Shree Adinath Woven Sacks Private Limited, undergo regular up-gradation, in order to attain a better position in the market. The facility parted into several highly operational units, facilitates smoother and effective management of the firm’s operations. The facility, for reasons of achieving several predefined goals and targets, has been equipped with all the needed machinery and equipment. In addition to this, our highly ethical work practices have helped us generate a huge client base, comprising reputed names like Mahek Plastic Industries, Abcus Combines Private Limited and Ashok Polyminator Limited. We are exporting our quality products in Middle East, Tanzania,Mozambique, Sudan, South Africa, Canada and Latin America, America, Spain, USA, Britain etc.